Please download Acrobat Reader(open in new window) to view the PDF files. 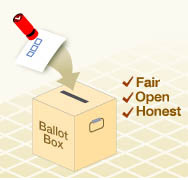 The information of this Introduction to Candidates pertaining to the candidates' personal information, views and election platform is wholly provided by the candidates. The Government or the Electoral Affairs Commission takes no responsibility whatsoever for the same.